While the manufacturing sector represents a robust 160,000 jobs in the state, the industry has a PR problem, especially with younger workers. The message of GOOD JOBS AT GOOD WAGES and a future career offering advancement in a growing company is just not getting through. And even with the state’s unemployment rate at 4.4% the industry struggles with recruiting, and needs potential workers to take a fresh look at manufacturing. 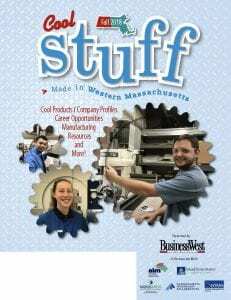 Introducing a new publication aimed at the workforce of tomorrow – A Guide to Cool STUFF Made in Western Massachusetts. STUFF is a cool, interactive publication and website profiling area manufacturers, showcasing what they make, who uses it, and what kinds of jobs/careers there are in each company. This special publication is an awareness and recruitment tool for western Mass. manufacturers like no other before it. If you are manufacturing in Western Mass. and have workforce development as a top priority, make sure your company has a profile in STUFF! Read about how this publication will become part of the efforts to expand the manufacturing workforce and area supporters. high schools through career fairs, guidance counselors. Community Colleges, as well as career counseling offices in all the state’s colleges. STUFF will be direct mailed to top manufacturers – CEO’s and Sr. executives at the top firms across Western Mass. Mailed to non-manufacturing employers in Western Mass.